There are hundreds of charitable organizations that aim to benefit people in the developing world. One of the best that I've come across is READ Global, which has built 57 libraries in rural communities in Nepal, India and Bhutan. Founded by Dr. Antonia Neubauer, who also started Myths & Mountains (one of National Geographic Adventure Magazine’s Best Adventure Companies on Earth), READ partners for-profit business enterprises with non-profit Community Library and Resource Centers. I visited a half dozen of these libraries in Nepal last spring and can testify to their ambition and success. It's remarkable work in some of the most remote villages and towns in the world. To learn more or to donate, in your name or someone else’s, visit READ. There’s no question that Dream of Italy newsletter is the single best resource for Italy-bound travelers and for those who can’t get enough of La Dolce Vita. It’s published 10 times yearly but right now, there’s a 2-FOR-1 Dream of Italy Subscription Sale going on. Here’s the deal: buy one subscription with a bonus DVD “Visions of Italy” included and receive an online subscription with bonus DVD “Visions of Italy” for free, a $79 value. You’ll also get immediate online access to over 70 back issues, those 10 full-color issues delivered online or by mail this coming year, and a free one-year online subscription with free DVD to give to someone else. Visit Dream of Italy for details. Abercrombie & Kent offers ultra luxe trips to some of the exotic locations around the globe, at prices that make most travelers think twice. But on December 10, 2009, A&K is having a one-day holiday travel sale. The countdown sale will begin at 9:00 a.m. Central Time, with savings of 5% on nine different itineraries. Every 30 minutes the savings will increase by 5% — to a maximum of 60% off the retail price at 3:00 p.m. Central Time — if the trip is still available. There is a choice of departure dates for each itinerary and clients may book multiple rooms on a first-come, first served basis. Trips include: Eastern Europe, East Africa, Chile, Galapagos, Egypt, Peru, Botswana/Zambia, Jordan and Turkey. Visit Abercrombie & Kent for details. My favorite piece of gear this year is the Patagonia Sweater Vest. While that name makes it sound like an article of clothing worn by your doting uncle, don't let the moniker fool you. It's ultra-light quilted down that compresses to about the size of a softball and can warm your core fast when you’re hiking, skiing, or sleeping in cold climates. It served me well last spring in Nepal, when I slept in Himalayan inns that oozed rustic charm but no heat. 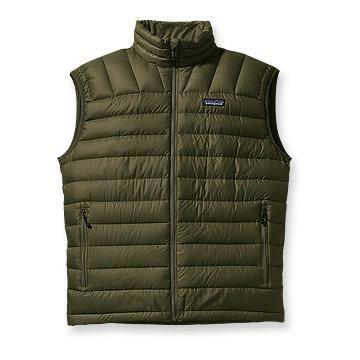 Patagonia says: “The innovative, superlight 100% all-recycled polyester shell (1.4-oz 22-denier) with a DWR (durable water repellent) finish provides wind and water protection as well as a high tear-strength; quilting stabilizes the down. With zippered handwarmer pockets and a drawcord hem.” They list it for $150 at Patagonia, but shop hard, because I nailed mine for 30 % less last spring. Most airline frequent flier programs allow you to share miles with friends and family. Take American Airlines, which just extended a special offer for Aadvantage Members to share their miles and earn a bonus for themselves. If you gift 6,000 or more miles between now and December 31, 2009, and you'll receive 25% bonus miles. For the month of December only, the limit of sharing 60,000 miles per account per calendar year has been temporarily raised to 100,000 miles and the limit of receiving 15,000 miles per account per calendar year has been temporarily raised to 100,000 miles. Visit AA.com for details.